The strong dramatic concentric lines of the mola series sometimes spook others when the stark white background takes on a polar-opposite look. You might recognize the unique fish that Natalia and Nicolas added last week. 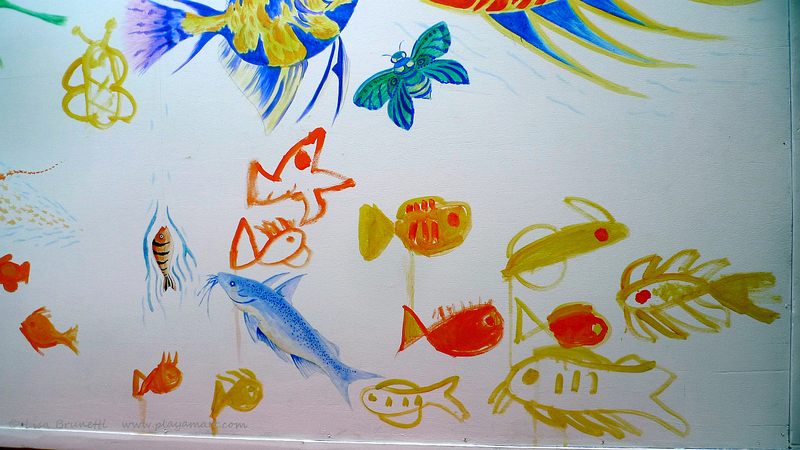 Their little fishes transformed well, don’t you think? Touches of garden plants fill negative space. Xavier dropped by a few nights ago and added more splashes of color! Whatdoyouthink? The 4 x 8-foot painting has a very long way to go, and it’s going well! While I’m watching birdlife, learning a new culture and creating whimsical paintings, Hugh’s studying current events and keeping me informed. Wonderful – I enjoyed this post immensely! thankyou! yes, the foliage balances well against those hot bright colors of red, yellow and orange. thanks for visiting hugh’s blog as well. his posts keep me informed with what’s happening in the world, as i get very little news here unless it’s on sluggish internet! The painting is evolving so beautifully. The evolution of this painting is fascinating to watch. It’s a lovely piece of work. Thank you, Suzanne! The next stage is a very complicated one, and that’s pulling the random paintings together with the mola lines and then color between those lines, and then a final application of blue/black to make the colors pop! Sounds fascinating. The mola lines are interesting. Are you going to blog about them and what the name means? Hey! Thanks for reminding me that those who are new to my blog are not aware of ‘the mola series’ and how it evolved. The Kuna Indians of Panama and Columbia create beautiful hand-stitched works of art that are called ‘molas.’ After a lifetime of traditional painting, I veered into an experiment inspired by the molas, which triggered a new style of painting. I remain sobered and baffled at how well received these paintings are. Here’s a post that explains about the molas. I love the look of wonder in the cat’s wide eyes as he silently observes the smiling fish in obvious delight. I love the reflection of the joy you see with your artist’s eyes, but most of all I love the fact that you share it with the rest of us! Amiga! how great to hear from you, and how great that we’re having a beautiful day of sunshine! thank you for your sweet comment, and i’m glad that the cat amused you! i’m glad you enjoyed the painting and the sea horses. 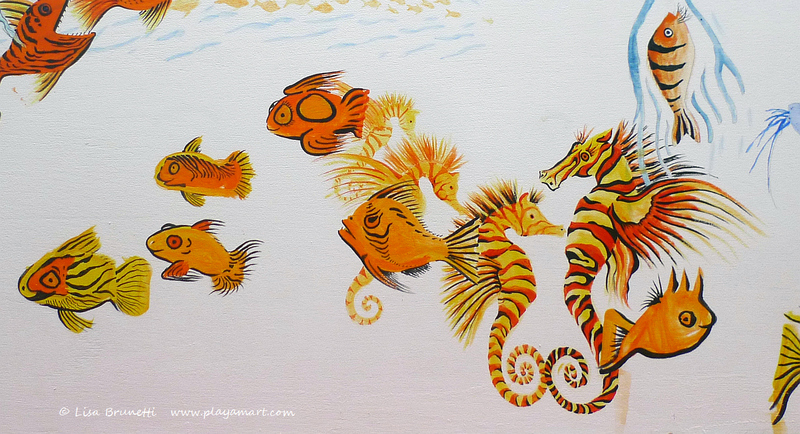 the sea horses were fun.. i looked at many images online, sketched a few, then ‘let them fly’ from my imagination. that was a fun exercise! thanks for checking out hugh’s blog as well. you’re very welcome; it’s a good site to keep up with what’s going on in the world, though told in a down-to-earth way. he’s fair and has a strong backbone and speaks up against things that are wrong. i replied to this yesterday but it must be swirling ’round in cyberspace. that’s what’s frustrating about the slow connections! You are more than welcome. It came from my heart. 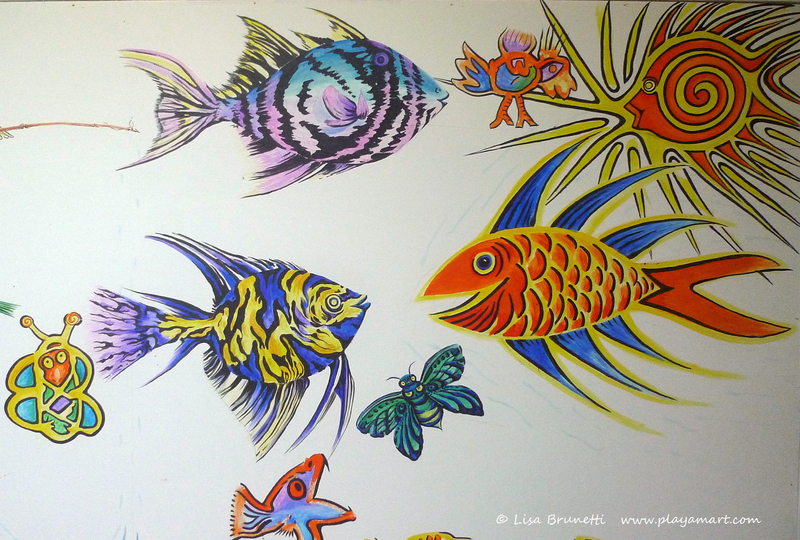 I love your posts — and I love the painting of the fish that is evolving before our eyes! thank you again, and i am glad that you’re enjoying the evolution of the painting! What a great project to see exciting designs splash across the screen this morning.I like your surprise.. and what a sharp eye for color. thanks! the colors certainly pop, don’t they? i’m glad you enjoyed this morning’s surprise! Wonderful, thanks for sharing this beauty coming alive. You sure are amazing. It is going to be outstanding. 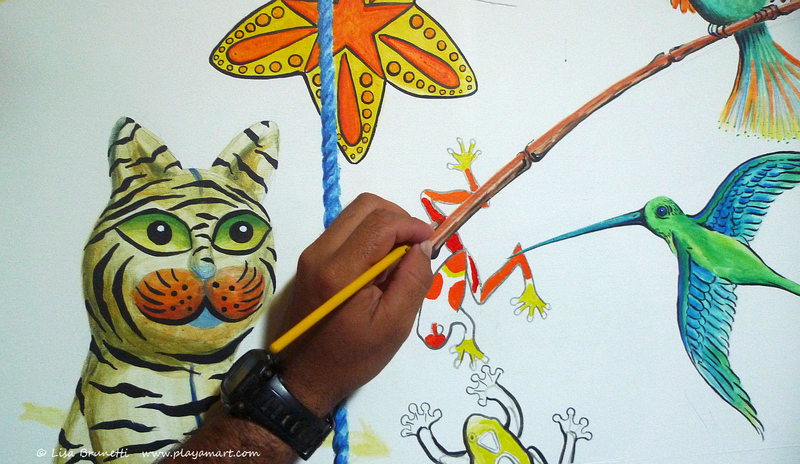 I love the way you integrated your young visitors work into the painting so beautifully. I just spent the better part of an hour checking out what Hugh Cutler has to say, enjoyed what I read immensely. Thank you! thank you; i continue to be honored and humbled by the bounty of amazing people who touch my life. you two are great examples as well; i am truly blessed. I love everyone of these. I’m decorating my apartment and they gave me a jillion ideas. Thanks for sharing. a huge smile crossed my face when i read your comment! i hope that you have fun with your apartment! i loved your sunset photos today! It’s like I came over for tea, and while admiring the work of many hands and feeling warmed by vibrant colors, a friend of yours dropped in and you introduced me. I enjoyed Hugh’s site, and more than that, I like how the world just got a little bigger. I like the idea of you, up to your ears in tropical beauty, taking time to discuss philosophical questions. you are such a beautiful person, and your writing reflects a very sensitive, creative and highly-intelligent person. i am so honored that you dropped by for (hibiscus) tea and that you were able to meet hugh was well! life gives us an amazing bounty, if we stay positive! thanks so much for your kind words. They are so really great, wonderful! thanks so much! bright colors surely help you get through those last months of winter! I think you did so much more than ‘cumplir tu propósito’. A masterpiece is coming! and it’s full of thankfulness, enlightenment and joy. Yo sé que no es una adelanto de “If fish could fly”, pero ya veo lo que estás haciendo, y es una maravilla! The respect for the autor is impeccable, and those fishes (already lighted) are becoming alive!… I can wait. Say hello to Xavier, and thanks again! you and your lovely family are here with me in spirit, especially when i work on those special fishes! i pondered the sweet souls that painted them and tried to follow through with colors and designs that they might have selected! nicolas was really wanting to use some blue, so i enjoyed mixing those colors just for him! yes, i now have a long way to go, but it’s going well! give my regards to everyone! This is coming along swimmingly! I like the concentric lines in the first photo. Thanks for keeping us up to date on the progress! thank you, ruth. suzanne wasn’t familiar with the mola influence, and i suspect that many people are not who weren’t following last year when the exhibitions were up. you would love the kuna indians and their textile art! I like the bold colors. 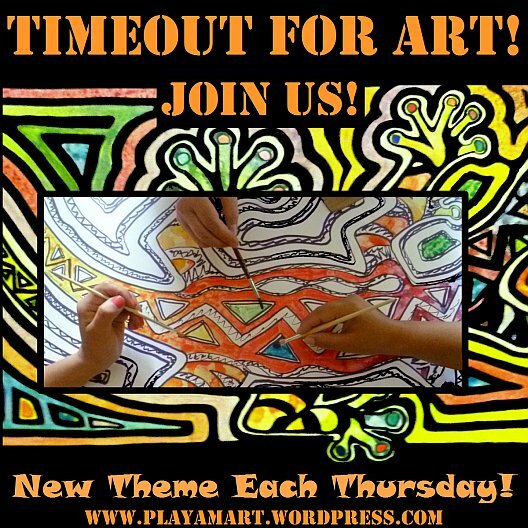 The artwork reminds me of work of MacKenzie Childs studios. I seem to be at the horses end, lately, but must comment. I went on Hugh’s site and commented. I believe you both complement each other perfectly…you both understand the philosophy of art which transcends into a sensitivity toward life itself. 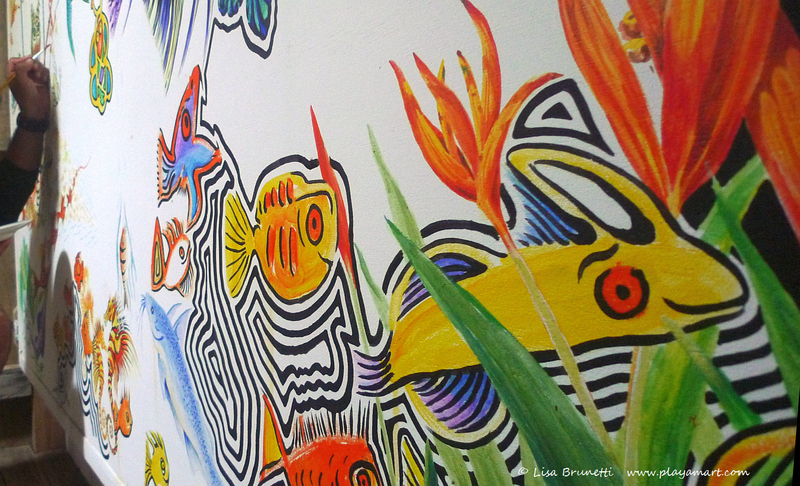 (if that makes any sense) The art panel is taking on a life of its own…love what you did with the children’s fish and the addition of seahorses and plants adds pizaz. thanks, dear friend! 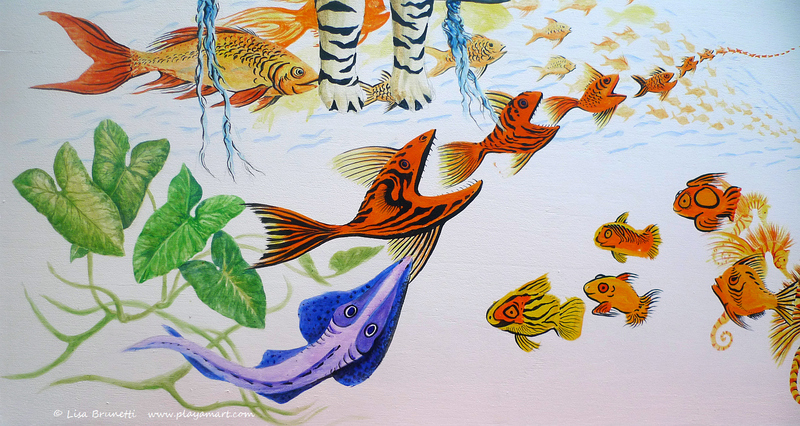 i am glad you enjoyed the progress on the painting and how the children’s fishes have evolved. yes, hugh is a gift to all of us! thank you so much for going there and commenting! i painted until about 11 last night, i think.. then did a fast internet session because that’s the only time i can view the videos that people post without the videos stuttering for the next ten minutes!!! paradise does have its problems! buen 🙂 s dias, btw, and have a great day! Probably my favorite, other than the Z’s under my vanity!!!! Colors are beautiful…………like the creator!!! thanks so much for your comment, bro! Transformation colorfully complete! Love it! thank you.. the painting and i are at that ‘tar baby and brer fox’ moment! i end up with lots of paint on my arms and hands as it progresses! it’s been fun yet challenging! How creative! Beautifully done. Love the colors. muchas gracias! i’m glad you like what’s happening there! I love your work, am imagining your patience and time for creation. I think that comes with age! Thank you, dear friend!